ROME, November 4, 2015 – Two weeks after its conclusion, the interpretations of what the synod on the family said still do not match up. But apart from the suspense over what Francis thinks and will say, the question remains. How well-founded is the interpretation of the final document of the synod – and above all of its paragraphs on the crucial point, that of communion for the divorced and remarried – as a text “open” to multiple discordant interpretations? Below is the first in-depth analysis of this issue. It was written for http://www.chiesa by the French Dominican theologian Thomas Michelet, a writer for the prestigious journal “Nova et Vetera” of the theological faculty of Freiburg. His conclusion is that if a clear and unequivocal magisterial document in line with tradition is not produced, the different pastoral practices already in existence will continue to develop, on one side fully in keeping with orthodoxy and on the other not, with the inevitable result of a “de facto schism,” legitimized for both sides by the contrasting dual interpretation of the results of the synod. But let’s see how Fr. Michelet comes to this conclusion. What does the synod really say about the divorced and remarried? It will have escaped no one that the question of the “divorced and remarried” (who should instead be called “separated-recommitted”) was the one most hotly debated during this whole synod on the family, by the synod fathers, by the faithful, and also by the general public, even making the front page of the newspapers regularly, something not seen for a long time. In short, few issues have raised as much interest. But let’s not set up too hasty an opposition between “the synod of the media” and the real one, and honestly admit that this conflict of interpretation has its source, at least in part, in the formulation of the text itself, which on this precise point lacks the clarity and precision that one might have hoped for after two years of work. As we had anticipated in July on http://www.chiesa, one may fear that quite a few synod fathers found themselves satisfied on this point of agreement for reasons that at bottom are extremely different, because the text allows different interpretations and the papering over of a division that remains in spite of everything and threatens to grow larger from now on, unless all is brought to light. Everyone remembers that in the “Relatio synodi” of October 18 2014, paragraph 52 on the access of the divorced and remarried to the sacraments of Penance and the Eucharist as well as paragraph 53 on spiritual communion were widely rejected, not having reached a two-thirds majority, or 122 out of 183 synod fathers (no. 52: 104 placet and 74 non placet; no. 53: 112 placet and 64 non placet). To these two paragraphs must be added the one on pastoral care for persons of homosexual orientation (no. 55: 118 placet and 62 non placet). Nonetheless these formally rejected paragraphs still found themselves included in the official text that acted as a working document for the next stage of the synodal process, surely in order to foster a frank discussion that would not conceal any of the difficulties. In the “Instrumentum laboris” of June 23, 2015, under the title “the penitential way,” paragraph 122 incorporated the previous paragraph 52, adding a paragraph 123 that began with the surprising statement that “there is a common agreement on the hypothesis of a path of reconciliation or penitential way.” The question then arose of what this mysterious agreement could be. All the more so in that the majority of synod fathers meeting in 2015 seemed instead to have expressed deep reservations in this regard, with the result that the hypothesis was ultimately not adopted, at least not in this formulation. In the “Relatio synodi” of October 24, 2015, paragraphs 84 and 86 now present a new pastoral proposal under the title “Discernment and integration.” The number of synod fathers present having grown to 265, the two-thirds majority became 177 and was been reached with difficulty in the case of these three paragraphs, in one case with just one vote to spare: (no. 84: 187 placet and 72 non placet; no. 85: 178 placet and 80 non placet; no. 86: 190 placet and 64 non placet). The 2015 “Relatio synodi” provides three magisterial references, all three contained in paragraph 85 and already present in the 2014 “Relatio synodi” and in the “Instrumentum laboris”: “Familiaris consortio” no. 84; Catechism of the Catholic Church no. 1735; the June 24, 2000 declaration of the pontifical council for legislative texts. However, the September 14, 1994 document of the congregation for the doctrine of the faith, referred to in no. 123 of the “Instrumentum laboris,” has not been reintroduced. What can one gather from the absence of an explicit reference in the document to this powerful conclusion of “Familiaris Consortio”? In a “hermeneutic of continuity” it will be maintained that silence equals consent, that the citation of a text refers to the whole text, which furnishes the citation with its true context. Therefore such a process of discernment can lead to the Eucharist only insofar as the believer has truly been able to emerge from this objectively disordered situation through a commitment kept by a firm intention, and has therefore been able to ask for the forgiveness of his faults and finally receive absolution. Short of this point one cannot receive communion. In a “hermeneutic of rupture” it will be maintained that silence equals dissent. If the conclusion of “Familiaris Consortio” is not expressly included, this signifies that it has become obsolete; the family context having been completely changed since then, at the end of a transformation that the document calls not only cultural but also “anthropological.” What was the discipline of the Church in the time of John Paul II should no longer be so in the new Church that is invoked. The conclusion will probably be that this process of discernment can lead to the Eucharist, even without a change of life, as long as the person has repented of past sins and has judged that he can “in conscience” receive communion. Can one imagine, then, that one of these circumstances could render the new marriage after a divorce non-imputable on the moral level? If this were the case, the new marriage would be invalid. It already is, of course, since marriage is indissoluble and remarriage is not possible while the first spouse is still alive. But it would not only be null as a marriage: it would also be so as a human act, it would be a “miscarried act.” So one could no longer speak of the divorced and remarried: there would not be any real new commitment, and no kind of bond between the two persons. Under these conditions, it is not certain that one would always want to apply the possibility of a total elimination of imputability. And then such psychological influences would lead one to bring into question the existence of the sacramental bond itself. The situation would then be entirely different. Vice versa, when persons are capable of exchanging a “yes” for life with the full awareness of what they are doing, they cannot help but realize that they are committing a fault against this “yes” with their new commitment to another person. It therefore makes no sense that the responsibility of such an act of recommitment could be brought back into discussion. Of course, there can be many types of motives that incite one to act this way, as paragraph 85 goes on to say: “In certain circumstances persons encounter great difficulties in acting differently.” This does not change the fact that they either know that they are harming their marital bond with the recommitment, and this is therefore a free and responsible act; or they don’t know it at all, and one can therefore doubt the very existence of their marital bond. “2. Any interpretation of can. 915 that would set itself against the canon’s substantial content, as declared uninterruptedly by the Magisterium and by the discipline of the Church throughout the centuries, is clearly misleading. One cannot confuse respect for the wording of the law (cf. can. 17) with the improper use of the very same wording as an instrument for relativizing the precepts or emptying them of their substance. “c) the manifest character of the situation of grave habitual sin. This declaration of the pontifical council for legislative texts therefore establishes that second marriages after a divorce are a situation of “serious habitual sin,” taken into consideration by canon 915 with regard to “those who stubbornly persevere in manifest grave sin.” The passage cited by the “Relatio synodi” specifies that this qualification must be understood objectively, not subjectively, “because the minister of communion cannot judge subjective imputability.” In other words, the situation is evaluated in the external forum, because one cannot access the internal forum. So then, in the context of the “Relatio synodi” this passage seems to take on another meaning: one cannot judge “subjective guilt,” and therefore one must abstain from qualifying this situation morally. Of course, the text does not expressly go this far, but those who do not take the trouble to go back to the text of the declaration could understand it in this way. And in any case the text does not say anywhere that what is in question is a sin, nor that Christ qualifies as adultery a new marriage while the first spouse is still alive (cf. Mk 10:11-12). This word can be hard to hear, but it comes from none other than the mouth of Christ, who measures its full effect. In this case as well, a “hermeneutic of continuity” will lead one to interpret this text by specifying what it does not say and maintaining the definition of “grave and manifest sin,” while a “hermeneutic of rupture” will take this silence as a cue to join in abstention from judging in terms of subjective guilt, which will lead one to eliminate any qualification of this situation in terms of sin, whether grave and manifest or not. In the first case, therefore, one will hold firm, in the light of the encyclical “Veritatis Splendor,” that remarriage after divorce is an evil act that can never be willed under any circumstances, in the context of a morality of objectivity and finality. The second case will present the invitation to convert one’s pastoral vision and to take circumstances more into account, and therefore to modify the doctrinal equilibrium of “Veritatis Splendor,” appealing to a morality of subjectivity and conscience. The pope has guaranteed that doctrine has never been touched, which inclines toward the first meaning. In fact, there are enough references to the magisterium to reinforce the supporters of the hermeneutic of continuity in their interpretation. But there are also enough silences and positive signals for the supporters of the hermeneutic of rupture to feel justified in their new approach. In the absence of further clarifications, both interpretations seem to be permitted. Concluding the analysis of these three citations, the omissions in the formulation probably explain why this paragraph 85 was the one that received the biggest number of non placet, and was approved with only one vote more than the required majority. But it is possible that further clarifications in one direction or the other would have lost it a few more votes; just one of which would have been enough for it to have been rejected. Interpreted in the context of a “hermeneutic of continuity,” these two paragraphs appear to be perfectly orthodox and in keeping with the recent magisterium. The citation of “Familiaris Consortio” no. 84 and of the declaration of the pontifical council for legislative texts permits one to understand this growth as a progressive conversion to gospel truth, all the demands of which each one will seek to translate in his own life. A pastoral approach of accompaniment should always aim at the full reconciliation of the believer and his final readmission to the Eucharist, according to the conditions indicated by “Familiaris Consortio” for putting an end to the “objective contradiction of the communion of love between Christ and the Church” represented by the new commitment with a person different from the legitimate spouse, which the Code of Canon Law defines in the external forum as “grave and manifest sin.” Here there is a true journey of holiness, delineated in beautiful words by the end of paragraph 86, which speaks of the “necessary conditions of humility, discretion, love of the Church and its teaching, in the sincere search for the will of God and in the desire to reach a more perfect response to it.” The recognition of integration into the Church would therefore be made in reference to the “order of penitents,” as it was called in ancient times, with limitations on the exercise of different ecclesial functions that would be interpreted in consideration of the objectivity of the disordered situation and could be removed according to the regularization of this situation. These two positions are presented in contrast here; it is not out of the question, however, that positive aspects and limitations could be found in each; hence the interest in putting them into perspective, error itself being able to serve in manifesting the truth even more. The limitation of the pure logic of objectivity is found in the consideration that we need time and various stages to reach the truth, so that this truth may be received not only as true in itself but also as true for its own sake, desirable and good, and finally possible to live and fruitful. The limitation of the pure logic of conscience is found in affirming the possibility of an erroneous conscience and in the evangelical necessity of freeing it from this error, so that it may become what it is, truly free, in act and not only potentially: “You will know the truth and the truth will set you free” (Jn 8:32). Finally we note a certain disquiet concerning the terminology of paragraph 84, which contrasts “exclusion” with “integration.” Such terminology is not customary in theology. It is typical, instead, of the egalitarian ideology that animates the LGBT movements in particular and liberationism in general, against an old background of Marxist dialectic, with a new nihilistic tendency. It is no longer class warfare, but the abolition of all classes, differences, categories, statutes… and therefore the disappearance of the true justice that gives each one his due (“suum cuique tribuere”), that is not necessarily the same for all, because the situations are not necessarily the same. If one begins to admit this kind of worldly opposition in an ecclesiastical document, the door is open to other categories of the population (persons with homosexual tendencies, women with respect to the male clergy, etc.) that will come to lament their “exclusion” for the sake of demanding their full “integration” into the Church. It would therefore be opportune to express in another way the search for communion with regard to persons who are not currently in full communion with the Church, on account of an objectively disordered situation that makes their admission to the Eucharist impossible, and to reaffirm instead the charity that urges us to do everything possible to bring them in truth into full ecclesial communion, in keeping with the demands of the Gospel. The “Relatio synodi” as such has no magisterial value, it is only a document delivered to the pope so that he may make a decision. One may therefore hope that in a post-synodal exhortation the pope will clearly determine the approach to be taken. Or that a document from the congregation for the doctrine of the faith may provide the necessary clarifications, for example in the form of a reminder of the correct interpretation of the magisterial documents, according to a hermeneutic of continuity. In the absence of this, what could happen? Everyone could go home happy, certain of having obtained what they wanted and of having avoided the worst, what the other side was calling for. Now, an agreement obtained against a background of ambiguity does not produce unity: it covers up a division instead. The pastoral practices already in existence could continue to exist and to develop, some according to the hermeneutic of continuity and others according to a hermeneutic of rupture. Falling back on the pastoral decision of each priest and believer “in conscience” would permit one to establish, with a document as support, a great variety of pastoral solutions, some fully in keeping with orthodoxy and orthopraxy, the others more debatable. Ultimately, if in one territory the priests encouraged by the “guidelines” of their bishop end up establishing practices that are uniform but divergent from those of other territories, this could lead to a de facto schism, legitimized for both sides by a dual possible interpretation of this document. And so we come to what we had presented back in July as a situation to be feared, if the synod did not succeed in defining a clear approach. And here we are. My Comment : Read the full article, it’s a bit “technical” but described the last Synod very well, a de facto Schism or like a Schism, so we will follow closely any post-synodal Exhortation from the Pope, on the way according to some sources and probably during the Year of Mercy, set up surely for a good reason, stay tuned. 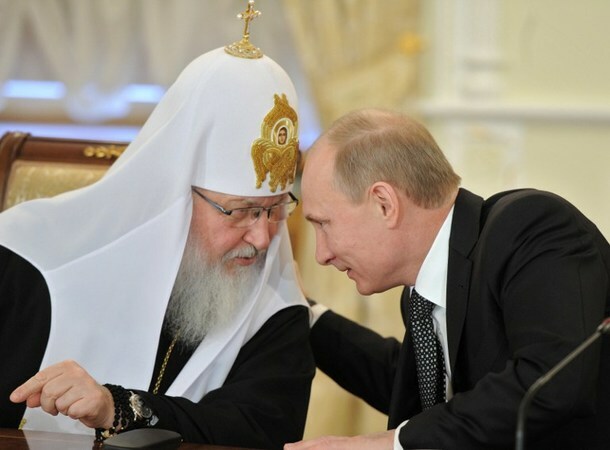 Patriarch Kirill urges to remember positive achievements of the Soviet period. Interesting post. However I’ve always perceived Garabandal as a message of hope in a troubled world. Granted there are good reasons to be concerned about the future and the urgency of the Holy Virgins Messages reflect that concern. Indeed in Her first message it is the conditional chastisement rather than the tribulation or even the warning that underscores everything else. Its intended severity should not be underestimated. Fortunately the means to avoid it happening are contained in the Holy Virgins second message and reflect the urgency of making both Her messages known. Despite our apprehension about what lies ahead there still remains an element of hope in it all. The Blessed Virgins call to conversion of heart and the restoration of one’s faith are central to an understanding of what our earthly pilgrimage is all about and what lies ahead. By the way, let me thank also the first 10 Subscribers, the Subscription option will be set up and online soon, thank you again for your confidence.